Experience is the best teacher of all, and if you do something long enough, you’ll eventually get good at it. So we’ve learned a thing or two over the years from working with our customers. We have a policy that our customers are always right, and there’s nothing we won’t try to do to satisfy their requests — within reason, of course. But sometimes, we’ve found, a customer will get a little confused about how to best proceed with a company offering logistics services. So here are a few tips to help guide you in meeting the logistical needs of your plant turnaround. Whoever you use as a supplier, make sure they are basically capable of whatever product or service you are looking for. Check out the supplier’s website and follow up on the phone with a customer service rep.
Plan ahead for whatever services or equipment you need. Don’t wait till the last day to place an order. Typically, it will take a supplier a day to round up the people and equipment you need for a function and another day to set everything up. You should always take into consideration the placement of temporary facilities, whether they are tents or office trailers or sanitation units. If you situate temporary equipment in a place where it will interfere with another business activity in the interim, you’ll have to add an additional cost to your invoice by asking the supplier to come back and move the temporary equipment. Try to know exactly where things should go beforehand. The best piece of advice we can give you when it comes to your turnaround needs is: Think things through and plan ahead. (That holds true for a lot of problems.) And please feel free to contact us for any other questions you have when you’re doing your planning. That’s what we’re here for. If you’ve visited our website recently, you may have noticed something different about it: a complete makeover. We’re a modern company offering some of the most highly respected clients in the country complete, state-of-the-art workforce accommodations, and we decided our website should better reflect that. We officially launched it in October, and so far, it’s gotten a wonderful response. One of the first things you’ll notice on the home page is that it’s sleeker and more visually appealing. Beyond that, though, are many changes that are built to make your experience on our site better. It’s much more user-friendly than our old website, and includes a lot more valuable information on our services. Click on any of the links and you’ll find full descriptions and informative areas of information, all of it as easy to navigate as it is useful. You’ll also notice we’ve added a “Request a Quote” function that allows you to easily receive a quote through our website. This added feature has not only proven helpful to our site visitors, but to us as well; we’ve gained many new contacts through this link. And did you know we are very active on social media? Now you can reach our Facebook, Twitter, Google+, and LinkedIn pages, as well as our blog, directly through our website. Want to check out examples of our past work? They’re right there on our home page. We’re very excited about our new and improved website, and encourage you to check it out. We think it better represents who we are, what we do, and how we’re constantly evolving and moving forward. Check it out and let us know what you think! As you probably know all too well, planning for and operating a large turnaround project can be overwhelming. There are so many details and logistics to work out, and not a single one can be overlooked. 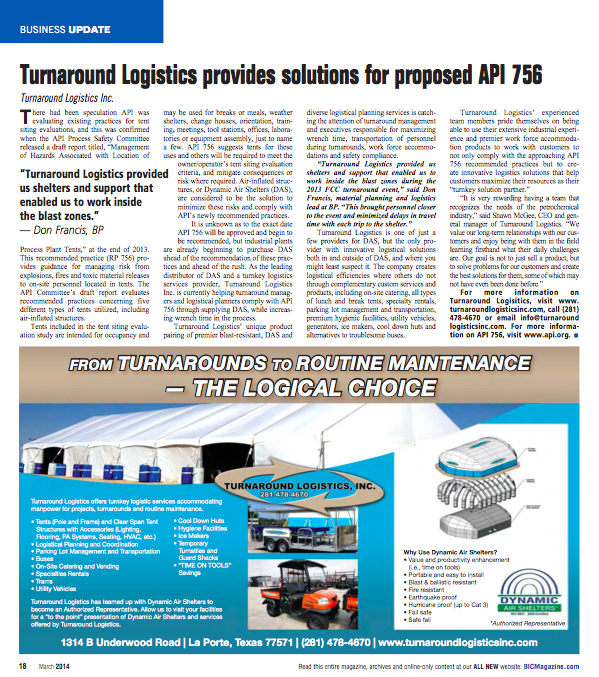 That is why Turnaround Solutions has become such a trusted source of logistical planning for so many petrochemical and power generation clients. They realize that it’s too much to plan on their own, and that we have the experience and know-how to get it done for them, and get it done right. One example of a current client for whom we are presently offering turnaround solutions is the BP Refinery in Carson, California. We first began the conversation with them back in the summer of 2012, and they were very impressed with what we had to offer. We started shipping equipment to them in October, by January we were in full swing, and it’s been going great. Currently, the BP refinery has 95 of our lunch/break/permitting tents, a Dynamic Air Shelter provided by us (complete with heating and AC), 200 picnic tables, 10 personnel, and a variety of our equipment serving all of their logistical needs. We’re so pleased with how it’s going, and happy to know they can get through their quick turnaround without having to worry about all the details that we are experts at. At Turnaround Solutions, we can accommodate everything from those aforementioned picnic tables and tents, to services such as on-site catering and hygienic facilities. To learn more about what we can do for you, visit our website. 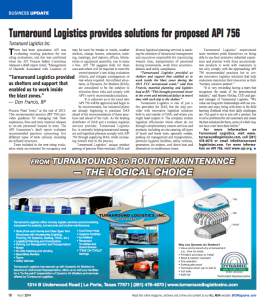 As many of our clients and readers may know by now, we at Turnaround Logistics have been providing turnkey services, including logistical planning, tents, Dynamic Air Shelters, personnel, and equipment, for years. While it could seem that our success in those areas would be enough to keep us content, we have recently decided to offer additional services. After some time having our satisfied customers ask if we could provide them with bus rentals, we’ve decided to go for it, and we’ve begun 2013 by adding that to our list of capabilities. We are now running transportation buses for turnaround projects, ensuring yet another aspect of logistical services is taken care of. Offering bus service that is manned and maintained, we officially launched the new offering in December 2012, and so far it is off to a great start. Many old and new petrochemical clients are eager to take advantage of our new bus service, including the Shell Refinery in Deer Park, Texas. We are beyond pleased to know that our loyal customers—as well as plenty of new ones—are trusting us with all of their needs, and are highly satisfied with the bus transportation services we are now providing. As a company that is on the cutting edge of the industry, with our finger on the pulse of what companies need and want for their workforce and logistical solutions, we’re delighted to keep adding to our company and growing as the need arises. We look forward to 2013 and what it brings, and especially to building and maintaining our relationships with our customers. Our light weight, versatile blast resistant shelters have become an industry standard on petrochemical and power generation sites. They are able to protect workers and equipment by dissipating blast forces up to a 6 PSI threat, .50 milliseconds. We can add additional protection by providing a geo textile wall that can resist debris equal to 155 mm artillery or 50 caliber direct fire. The recent events this year in California and Oklahoma in which petrochemical plants had explosions, demonstrates the importance of blast resistant shelters. While events like these do not happen often, they do occur. Our shelters can keep you and your employees safe and mitigate the health and safety regulations within the confined space. We provide installation services and any shelter can be installed with just a forklift. 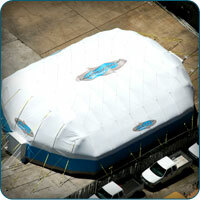 Please visit our website to browse all of the options available for your custom inflatable blast resistant shelter. All shelters come with a comprehensive 2 year warranty. Extended warranties are also available. By now, you know that we offer a wide variety of logistical services to our clients and recently, we have offered a few more. When Bayer Aspirin Chemical scheduled their outages (which normally happens in the forth quarter of the year), they turned to us to provide temporary shelter and workspace. During the scheduled outages, the plant is shut down and maintenance is done, to make sure that things continue to run smoothly. Many times, contract personnel is brought in and they will come to the plant to perform work during the turnaround. We provided an 80 by 120 pole tent to provide shelter from the elements, so that everyone would have a place to go for lunch or during a much needed quick break. Another recent job was for Shell Refinery in Deerpark, Texas. We provided them with 3 tents (40 by 60, 40 by 80 & 40 by 100) for their scheduled turnaround that began in September. We were sure to have these tents sent up well in advanced so that things were set up perfectly when the work began. Lastly, we supplied a 40 by 40 tent for Turner Industries at TPC that will be used for 10 to 12 months during a construction job. Within that tent, we also provided the picnic tables and the lighting. We will continue to go to their job site every month to check that that the anchoring has not loosened and to provide any necessary maintenance. As you can see, we take pride in our work, here at Turnaround Logistics and we will take every action to make sure that our products and services are up to top standards. Visit our site for more information.